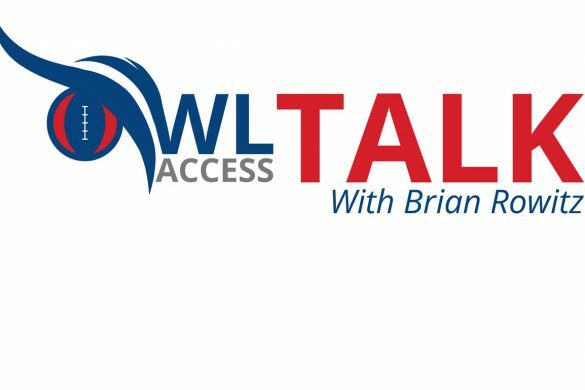 Home FAU Football	Signing Day LIVE! 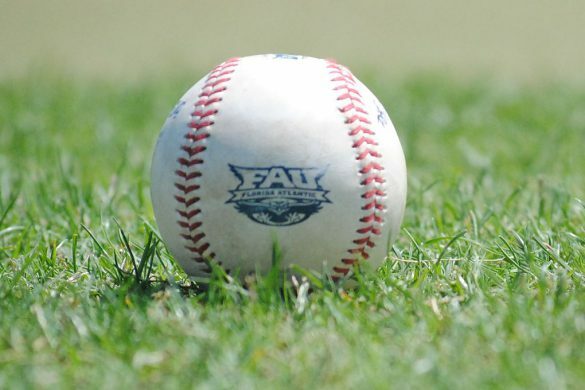 FAU enters National Signing Day having already signed eight players to its 2019 signing class during December’s early signing period. Ten additional players already publicly pledged to sign with the Owls today. 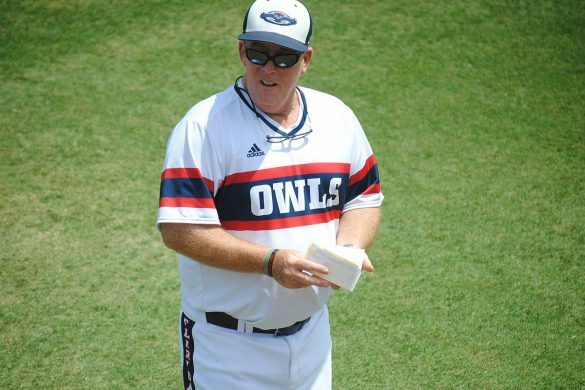 Another 10 or so recruits who’ve been waiting until signing day to announce their decision will choose the Owls over schools like Indiana, Iowa St., South Florida, Southern Miss, Marshall and FIU. 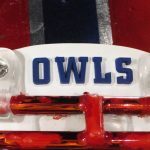 Perhaps even Michigan St.
OwlAccess.com is the source for the latest in FAU Signing Day News. 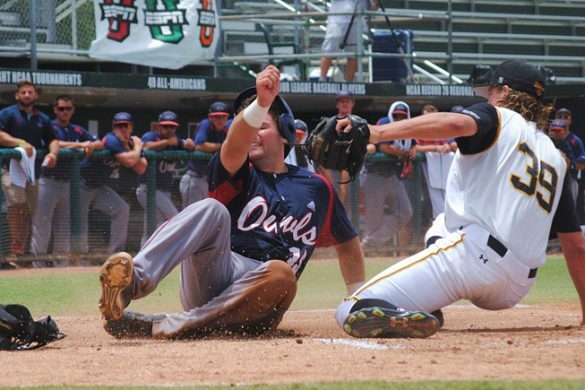 Each time a player signs with the Owls we’ll post his bio below. Check back often to get to know the newest Owls. And if missed any of the players who signed in December we have bios on them, too, down below. Scouting Report: Cook boasts 4.6 speed – not the fastest but it can play at this level. Played both running back and slot receiver as a senior. Can also return kicks. Other Suitors: Cook first committed to Louisville, then to Missouri before re-opening his recruitment. He chose FAU over Kansas. Scouting Report: Caught 24 passes for 301 yards and three touchdowns – all team highs – for run-heavy Niceville. A good route runner, Cole also runs track for Niceville, specializing the 110-meter hurdles, an event in which he finished fourth at the 2018 state meet. Also played safety for Niceville. Other Suitors: Cole was committed to Middle Tennessee before making an official visit to FAU during the final recruiting weekend and changing his mind. Scouting Report: Wynn accounted for more than 4,000 yards and 62 touchdowns during his high school career. Was a finalist for Tennessee’s Mr. Football as a senior. When Notre Dame lost its QB this season, they switched their offensive scheme to a single wing, having Wynn take direct snaps. Other Suitors: SEC schools backed off Wynn because of his academic issues. 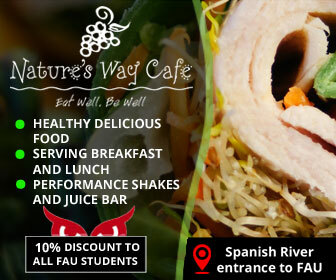 Wynn does still have to get a qualifying test score, so he won’t be announced officially announced by FAU later today. 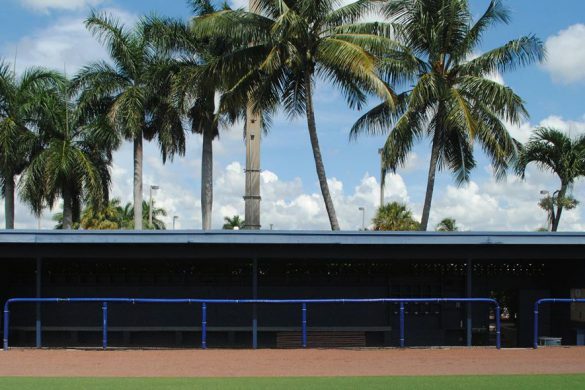 Scouting Report: Nelson did a little bit of everything for Pahokee this season. He can catch the ball and is excellent once the ball is in his hands. He can also return kicks. Yet another athlete in this class that FAU can put in multiple positions. 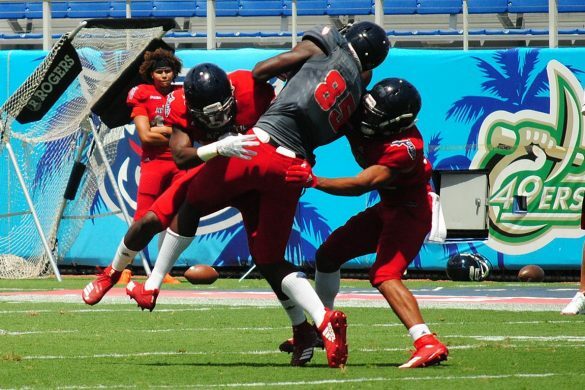 Other Suitors: Nelson was committed to Marshall before flipping to FAU on Signing Day. Also had early interested from some Power 5 schools. Scouting Report: Primarily a basketball player, Tolliver only played football for one season. He showed good feet in pass protection and Autauga backs followed Tolliver on nearly 88 percent of their running plays. Tolliver’s 89-inch wing span – almost unheard off in college football – helps him keep pass rushers at bay. Other Suitors: Tolliver committed to Troy early but reversed his decision following the Trojans’ coaching change. He ultimately chose FAU over Indiana. Scouting Report: Plummer was recruited as a wide receiver by FAU but could easily end up at corner or safety. Caught 44 passes for 557 yards and four touchdowns as a senior. Flipped his commitment from South Florida to FAU late in January. For his final semester in high school Plummer moved from transferred from Mainland to Tallahassee-Rickards, where he spent his initial high school semester. Other Suitors: USF, Marshall and Iowa St. showed the most late interest in Plummer. Scouting Report: A second-team Class 7A All-Georgia selection, Merritt finished his high school career with 20 sacks. A disruptive defensive lineman, of his 60 tackles as a senior, 36 went for loss and 10 of those were sacks. Merritt still has some academic work to complete. He also signed a letter of intent to Mississippi Gulf Coast C.C. in case he doesn’t qualify. Other Suitors: West Virginia, Virginia Tech, Pitt and Marshall were all interested in Merritt but backed away when his grades slipped. 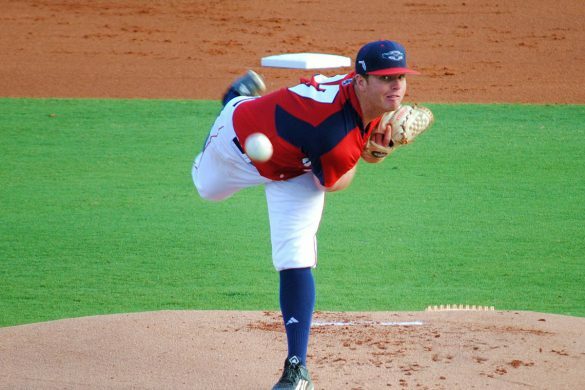 Merritt ultimately chose FAU over Liberty. Scouting Report: Nicholson caught 36 passes for 721 yards and six touchdowns as a senior. He rushed for 355 yards and eight scores, often playing wildcat quarterback. Nicholson also intercepted four passes as a defensive back, returning one 98 yards without scoring (think about how rare that is). A standout kickoff and punt returner, Nicholson used his 4.5 speed to score 16 total touchdowns as senior. Other Suitors: Nicholson was committed to Southern Miss until the final recruiting weekend when he visited FAU and flipped. Scouting Report: Originally signed with FAU during the early signing period but elected to keep his choice quiet until National Signing Day. At one point Posey was committed to Western Kentucky but de-committed following a change in the coaching staff. The dual-threat QB threw for more than 2,000 passing yards and added another 500 on the ground, accounting for 41 touchdowns. 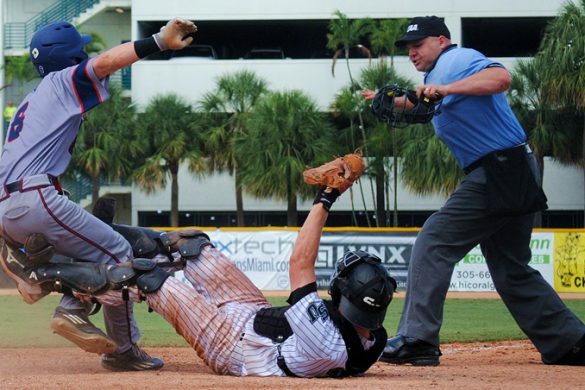 Other Suitors: Army and Appalachian St. showed early interest, but Posey surprised by signing early with FAU. Scouting Report: Thomas is a high-energy defender who recorded 15 sacks and forced eight fumbles as a senior. He could play linebacker or line up as a pass-rushing defensive end for the Owls. Thomas possesses a non-stop motor that allows him to pursue the ball from sideline to sideline. Would have signed with FAU in December but had some academic issues to clear up. He’s all caught up in the classroom, now the Owls must wait on his standardized test scores. Other Suitors: Heavy hitters like Florida, Miami, Syracuse and Illinois all pursued Thomas early but backed away because of the academic issues. 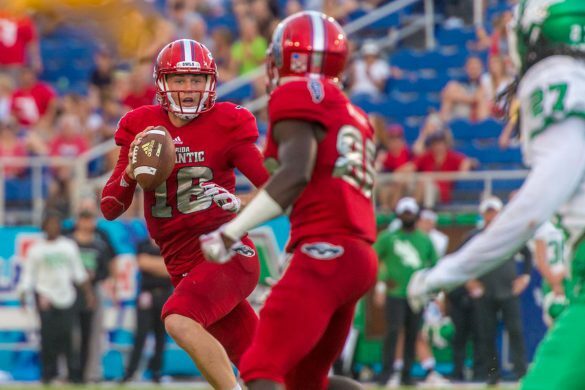 FAU stuck with Thomas and was rewarded on Signing Day. 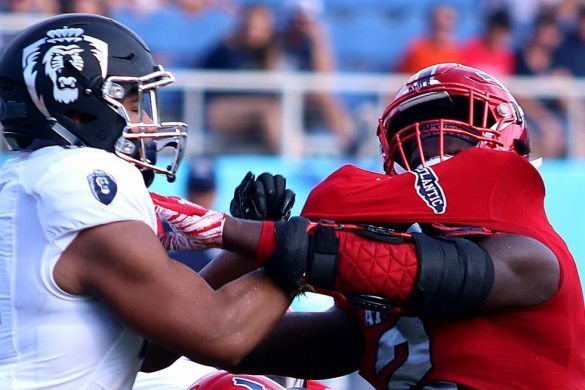 Scouting Report: A relatively raw offensive lineman, Richardson didn’t receive his offer from FAU until the final week of the recruiting process. 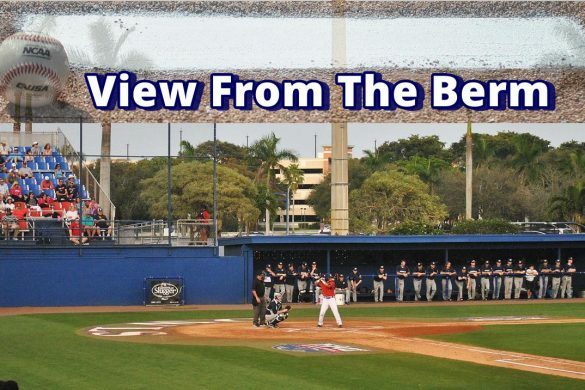 He visited FAU during the final weekend, cementing his decision. Possessing a strong work ethic, Richardson is a quick learner who, at the moment, is a better run blocker than pass blocker. 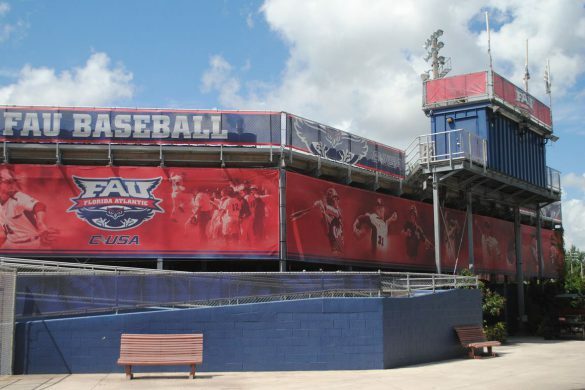 Could move to the interior of the line at FAU. Other Suitors: Richardson made an official visit to FIU, his likely destination had FAU not offered. Scouting Report: As a senior, his first full year at running back, Edwards notched 222 carries for 1,907 yards (8.59 yards per carry) and 26 touchdowns. He only fumbled once in two seasons. Most schools, notably Auburn, recruited Edwards at linebacker – some even think he’s a defensive end – but Edwards wants to carry the ball. Other Suitors: Edwards can claim nearly two dozen offers. UCF and USF stayed on him late. Scouting Report: McCammon amassed 1,413 yards rushing yards and scored 16 touchdowns while playing for one of the most storied high school programs in the nation. A well-rounded back, he also caught 25 passes for 312 yards and one more score. McCammon returned a kickoff for a touchdown and excels at pass blocking. 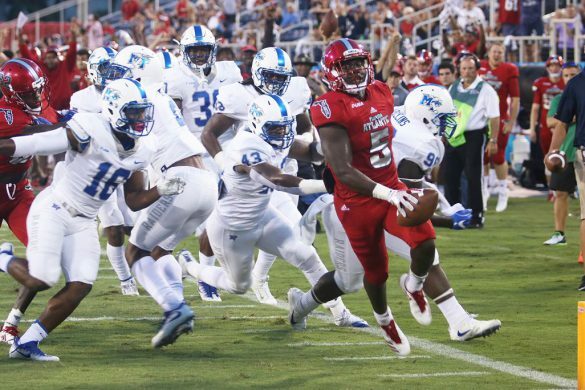 Other Suitors: Iowa, Michigan and Rutgers pursued McCammon, but the recent success of FAU’s running backs under Lane Kiffin persuaded McCammon to come to South Florida. Other Suitors: Henry committed to West Virginia, but the Mountaineers backed away after the injury. He ultimately chose FAU over South Florida. 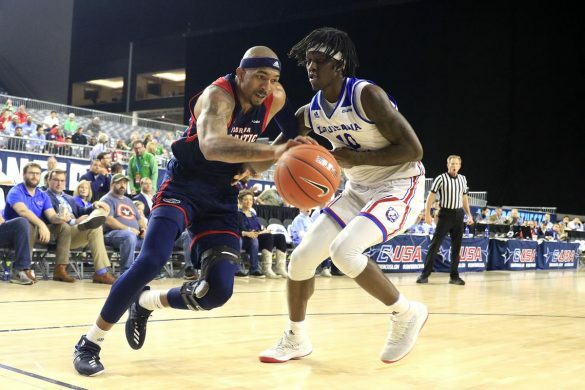 Scouting Report: Meeks committed to FAU prior to the start of his senior season. That season ended abruptly when he tore his ACL late in the year. Meeks will grayshirt, meaning he signed but won’t arrive at FAU until January, giving his knee time to fully heal. When healthy Meeks is a shifty ball carrier with good speed. Other Suitors: Middle Tennessee, UAB and South Dakota all pursued Meeks at one time. 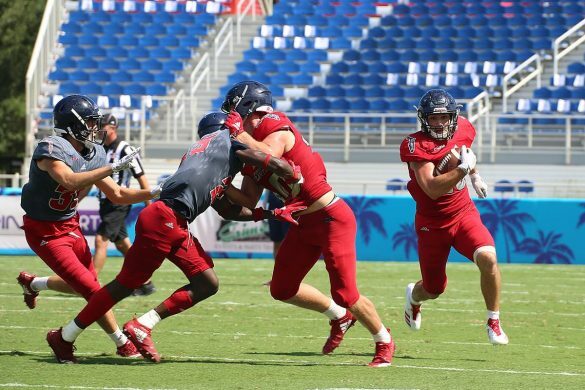 Scouting Report: Signed with FAU after only playing one season of football. Intends to play both football and basketball as an Owl. Recorded 17 sacks as part of his 88 tackles as a senior. Also tipped two passes that resulted in interceptions. Other Suitors: Bradley’s decision came down to FAU and Central Michigan. He chose the Owls. Scouting Report: Primarily a quarterback during his high school career, Martin will switch to wide receiver at FAU. Martin was a highly sought-after athlete before tearing his ACL prior to his senior season. A tremendous athlete, Martin has already recovered enough from his surgery that he can dunk a basketball from a flat-footed jump. Martin rushed for more than 2,300 yards, scored 21 rushing touchdowns, and passed for more than 1,500 yards and 18 TDs as a junior. Other Suitors: Martin had plenty of interest from Power 5 schools prior to the injury. He ultimately chose FAU over Louisville and Memphis. Scouting Report: Roberts tallied more than 1,000 yards receiving and accounted for more than 20 touchdowns. Totals could have been even higher but Rome kept him on the sidelines for the second half of most games because of blowouts. Two-time state champ. He runs a 4.51 40-yard dash. Other Suitors: SEC teams showed plenty of interest in Roberts, but a poor academic start caused them to back away. Roberts righted the ship and owns a qualifying standardized test score. Scouting Report: Jean recorded 11.5 sacks as a senior. More than half of his 60 tackles came behind the line of scrimmage. Possesses a quick first step when rushing the passer but is probably a better run stopper than pass rusher at this point. Will benefit greatly from a redshirt season. 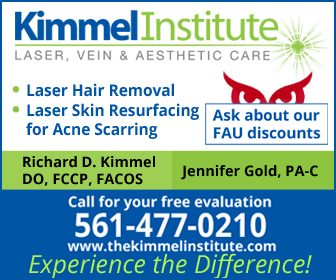 Other Suitors: Choice came down to Indiana and FAU. Rutgers made late push. 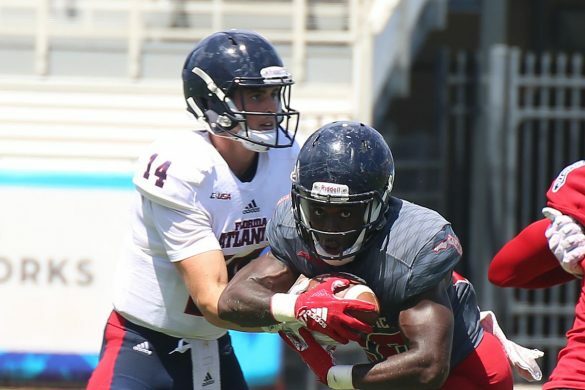 Scouting Report: One of the earliest commits to FAU’s 2019 class, Ashe intercepted three passes, returning them for a total of 175 yards as a senior. He recorded 42 tackles in 2018 with two of his three tackles for losses being sacks. His bond with FAU assistant coach Keynodo Hudson, Ashe’s primary recruiter, kept him from listening to Power 5 schools. Other Suitors: Once he committed to FAU SEC schools, Florida included, tried to lure Ashe away. Scouting Report: Maranges moved to Miami from Puerto Rico to escape the devastation caused by Hurricane Maria. He only played one year of high school football. 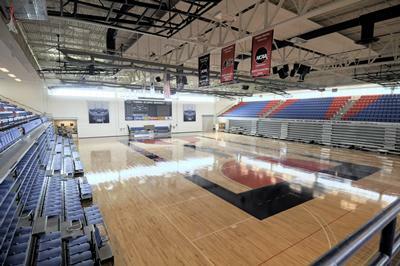 Will likely play guard at FAU. Other Suitors: Most schools didn’t even hear about Maranges until late in the process. 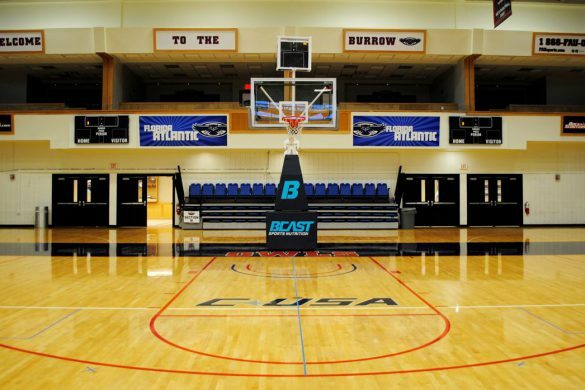 FCS schools LIU and Bryant offered scholarships. Scouting Report: Josey led Rockledge with five sacks while recording equally as many pass deflections. He totaled 40 tackles as a senior, with 12 coming for a loss. Primarily a basketball player before switching to football as a senior, Josey is undeveloped as a football player but offers raw talent. Other Suitors: Marshall made a late push, but Josey shunned a visit to the Thundering Herd after committing to FAU. Caliph Brice, LB, Hutchinson C.C. Scouting Report: At 6-foot-2 and 235 pounds, Brice has the size to make an immediate impact. He can play inside or outside, but operates best in space. 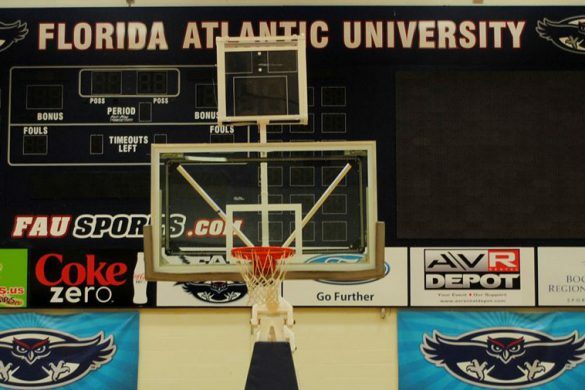 Though he signed in December, he’s not expected to arrive at FAU until the summer. Other Suitors: Conference USA foes Southern Miss and Old Dominion also offered Brice. Scouting Report: Bryant caught 19 passes for 335 yards and four touchdowns in nine games for the College of the Sequoias. The deep threat’s statistics likely would have been more impressive had COS not lost two starting quarterbacks to injury. Arrived in January and has four years to play three seasons. The Word: “I think he’s an NFL wide out,” – COS coach Joe D’Agostino. Scouting Report: Dean rushed for more than 1,300 yards and 13 touchdowns as a senior. In his high school career he’s responsible for more a whopping 74 touchdowns. The athletic ball carrier also intercepted five passes and returned three kickoffs for touchdowns. Other Suitors: Dean chose FAU over Temple during the early signing period. B.J. Emmons, RB, 6-0, 230, Hutchinson C.C. 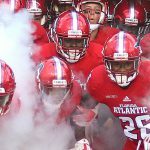 Scouting Report: Emmons originally signed with FAU in 2018 but didn’t report to FAU until January of 2019. He’ll almost certainly count toward the Owls’ 2018 signing class. The former Alabama running back played for Lane Kiffin while the now FAU coach was the offensive coordinator for the Crimson Tide. 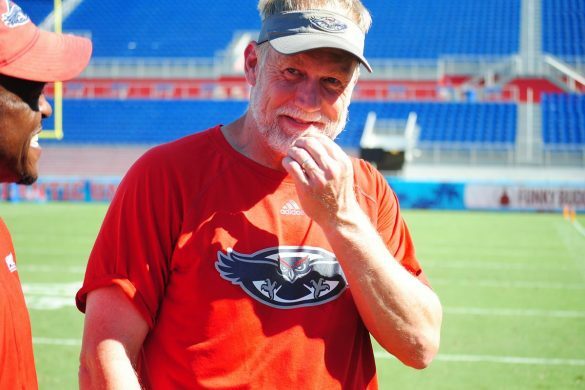 Other Suitors: FAU beat Louisville and East Carolina for Emmons’ talents. 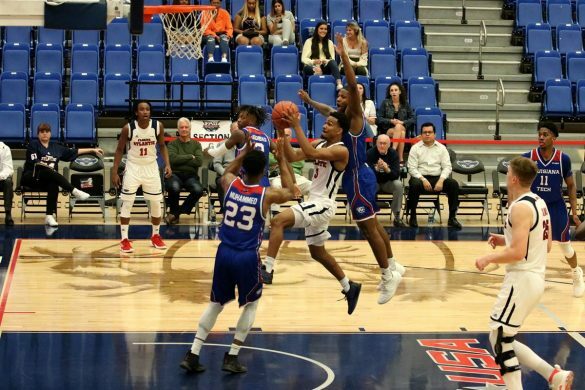 Scouting Report: Epson could immediately step in and fill the role created by the graduation of starting guard Antonio Riles. An All-MACJC selection following the 2018 season, Epson has two seasons of eligibility remaining plus a redshirt year, if needed. He signed late in the early signing period and is already taking classes at FAU, making him eligible to participate in spring practices. His scholarship will count against the 2018 recruiting class. Other Suitors: A former Ole Miss commit, the 6-foot-3, 322-pound Epson reportedly signed with Louisiana-Lafayette out of high school but never enrolled. 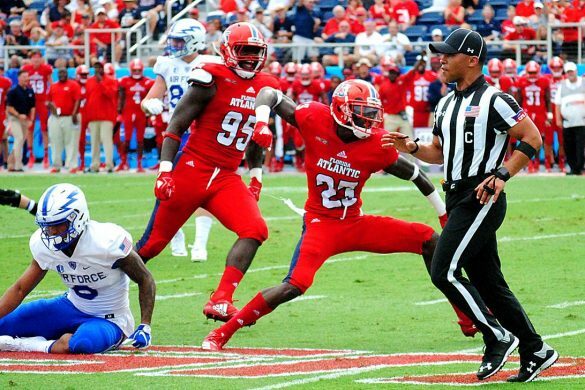 Scouting Report: Dynamic linebacker graduated in December and enrolled at FAU in January. 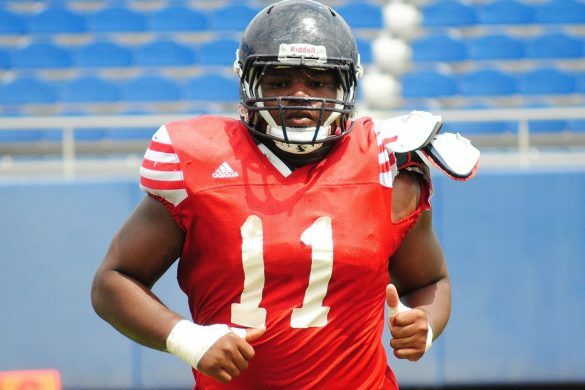 Could make an instant impact at a position of need for FAU. 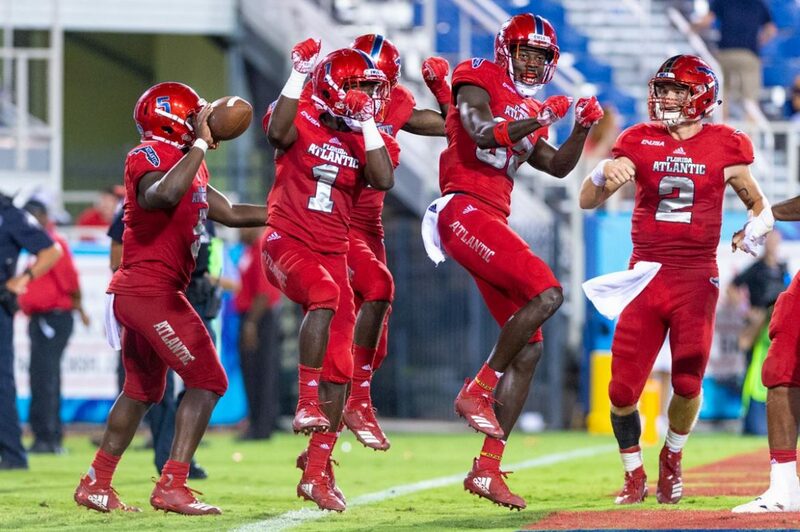 Other Suitors: Indiana, FIU and Marshall all reportedly offered Howard. Scouting Report: Possessing good size and speed, Lewis could play either linebacker or safety. With the trend toward positionless defense, maybe he’ll do both. Also plays centerfield on the baseball team. Other Suitors: Lewis committed to FAU early in the process, keeping most other suitors at bay. Scouting Report: The Pensacola News-Journal selected Moultrie for its All-Area team. Moultrie recorded 114 tackles, including 12 for loss, and returned a fumble recovery for a touchdown. 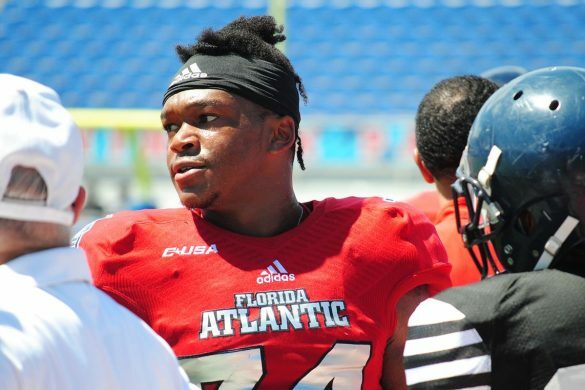 Scouting Report: Brother of FAU linebacker Rashad Smith, Rahmod took an official visit to FAU during the final weekend before the early signing period. 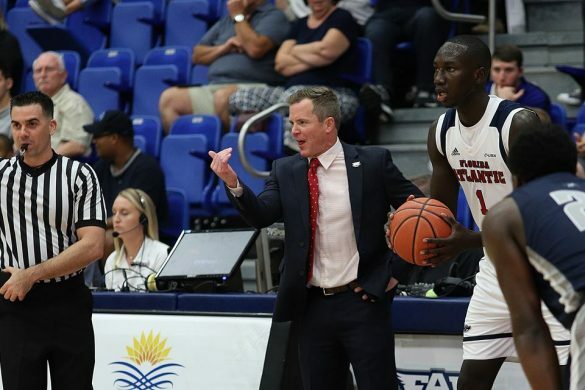 Smith hoped to arrive at FAU for the current semester but that didn’t happen. A former basketball player, Smith didn’t take up football until late in his high school career. He jumped from quarterback to tight end before settling at tight end. 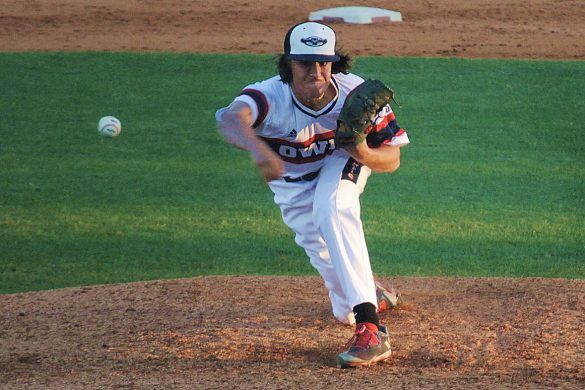 Other Suitors: Smith had been committed to UNLV before signing with the Owls. Scouting Report: Tall and long, Toombs could play safety or nickel. He recorded 70 tackles. Intercepted four passes and forced three fumbles as a senior. 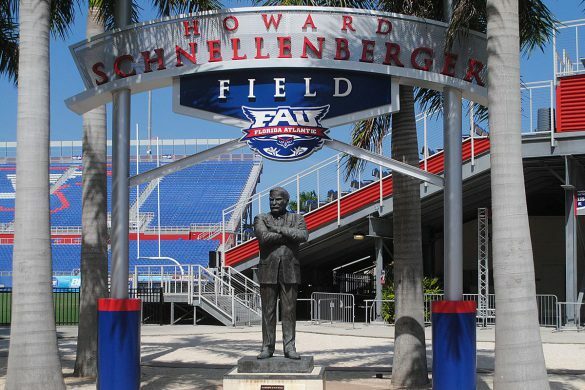 Toombs is already enrolled at FAU and will participate in spring practice. Other Suitors: Southern Miss, Iowa, and Utah all wanted land Toombs, but the Treasure Coast product elected to remain close to home. Scouting Report: Another hybrid linebacker/safety, Williams helped lead Palmetto to a 27-6 record during his three seasons as a starter. Other Suitors: Marshall, Buffalo and Cincinnati all pursued Williams.